Leads the congregation with chanting the parts of the Mass and singing hymns as appropriate for the Liturgy. Readers proclaim the Word of the Lord during Mass. Greets and seats people, distributes bulletins, and responds to emergencies. The pastoral council is a consultative body and is governed by norms determined by the Archbishop. It collaborates with the pastor to discern through consultation how to address the challenges and opportunities encountered by the parish in its particular time and place. The parish finance council is composed of Catholic faithful who offer advice to the pastor in the administration of the parish’s temporal goals. Its purpose is to provide the pastor, the parish pastoral council, and other leadership bodies with professional financial analysis. Assists the Pastoral Administrator in providing quality faith formation consistent with Archdiocesan policies and guidelines including assessment of parish needs and acting in an advisory role in recommending plans for faith formation. Helps maintain tidiness of the Sanctuary. 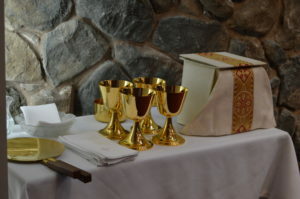 Gives Communion to those who cannot physically attend Mass due to health constraints. Hosts annual events such as the Outdoor Sale (May), Oktoberfest (September), and Parish Picnic (August), as well as the Parish Breakfast (last Sunday of every month Jan.-Nov.). Hosts of coffee hour after Sunday Masses and celebration meals throughout the year, Fall Festival (November), Adopt-a-Family (several) for Christmas, fundraisers, workshops, monthly member birthday celebrations/luncheons, annual member Christmas party, and a variety of special parochial celebrations throughout the year. Members meet in the hall every second Tuesday of every month at 10 AM. All women of the parish are members so please join us. Whether you are new to the parish or have been here for many years, we encourage you to share your time, talents and treasures in support of the Mission of our parish community. Composed of parishioners, members of the Society of Saint Vincent de Paul provide aid and prayerful healing to members of the community. To contact SVP leave a voicemail at (360) 458-1904 or leave an email.